1955 was a bad year for motor racing. The tragedy at Le Mans that claimed the lives of 83 spectators and one driver while injuring more than 120 others irreversibly changed the way that not only the public viewed racing, but the way manufacturers thought about it too. The crash signaled the end of Mercedes’ official full scale factory-backed participation in sports car racing until 1997. Jaguar too, once a dominant force with their C-Type and D-Type racers pulled out of racing for a short while. What then were they to do with the remaining D-Type race cars that they had sitting around? 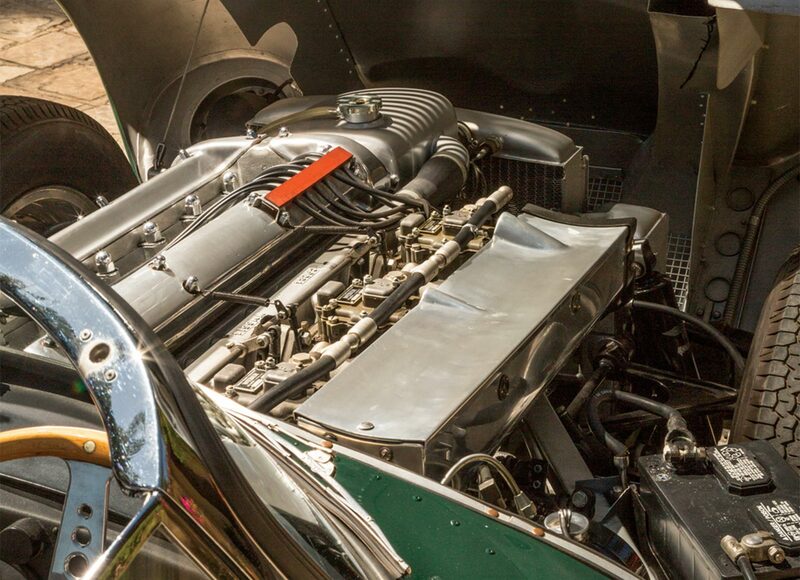 The D-Type with its snarling straight six and all-conquering disc brakes was, like many endurance racing cars of its day, not as wildly different from road-going cars as race cars are today. Jaguar decided, in a fit of genius and with some persuasion from American racer Briggs Cunningham, to convert the D-Types into street cars and sell them to the public, thus fulfilling the Sports Car Club of America’s homologation requirements, and so was the XKSS born. The XKSS was essentially a D-Type race car sans the distinctive fin and with a few minor creature comforts added on. The XKSS retained the race car’s disc brakes and its dry-sump 3.4 liter straight six that produced in excess of 250 horsepower. Jaguar engineers added a passenger door (barely), a passenger seat, bumpers, a luggage rack, turn signals, larger tail lights, side windows and a roof. The XKSS was as fearsome a street car as it was a race car with the ability to make the run to 60mph in just a hair over 5 seconds, a respectable time even today. The car’s aluminum body and Dunlop disc brakes also made it turn and stop like nothing else on the road at the time but the short wheelbase and less than stellar tire technology available at the time made it something of a widowmaker as well. Clearly, the XKSS was not the province of amateurs, and only the truly salty need apply. Jaguar managed to crank out sixteen of the planned 25 XKSS models before tragedy struck the Brown’s Lane factory in which they were built. A huge fire swept through the factory and destroyed cars and machines en masse. Jaguar, which has throughout its life always been in a somewhat financially precarious position, set about rebuilding the factory as quickly as possible but at a time when they were struggling to get their normal production models out the door, something as extravagant as the XKSS fell by the wayside. The program was effectively cancelled and the company moved on. 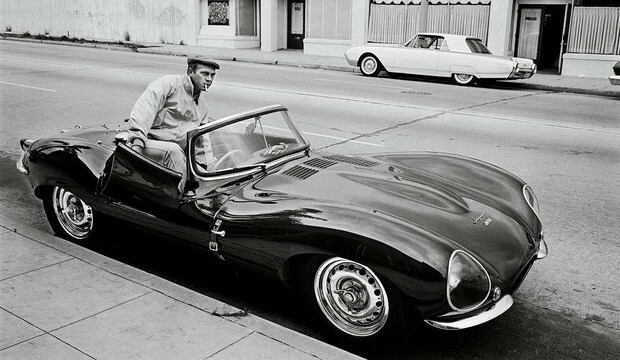 The sixteen extant XKSS models soldiered on, garnering praise and respect from their owners. Perhaps the most famous XKSS owner was none other than the racecar driving, pistol toting, motorcycle fanatic King of Cool himself, the right honorable Steve McQueen. Though McQueen is the man most closely associated with the XKSS, he wasn’t the original owner of his car. He purchased the car from a Los Angeles local television personality in 1958 for the princely sum of $5000, or more accurately, persuaded his wife to purchase the car. Five grand doesn’t sound like much, and even in 1958 that wasn’t a colossal outlay for a car like the XKSS. In fact it works out to about 41 grand in today’s money. Still, he bought it and as he was wont to do, he drove the bejesus out of it. The car today is handsome in its staid shade of British Racing Green with its black leather interior but when he bought the car it was a little more brash in off white paint with red leather splashed across the interior. McQueen took the car to legendary hot rodder and builder Tony Nancy who facilitated the color change. Steve McQueen tended to not do anything by half measures and this ethos of course extended to the way he drove. He and his “Green Rat” began to terrorize the greater Los Angeles area with regular jaunts well into the triple digits and numerous run-ins with the local constabulary. Eventually, probably due to mounting pressure from his wife Nellie, he sold the car to William Harrah of Harrah’s Casino fame. Eight years later, he bought it back paying double what he got for it when he sold it initially. Though the XKSS holds a special place in the pantheon of history’s great cars, the fact that there were only sixteen of them means that few people have seen one in person. The fire that destroyed the remaining cars also took with it the bucks, jigs and tooling necessary to build more. This seems to have rubbed someone at Jaguar the wrong way because now, hot on the heels of their achingly beautiful continuation model Lightweight E-Types, Jaguar’s Heritage division has made the decision to finally complete the remaining nine cars. How does one go about recreating one of history’s greatest road cars when there are only a handful to be found and all the tooling used to create them originally was destroyed? Technology, of course. Jaguar Heritage was able to locate a couple of the cars and then used laser scanning technology to get all of the dimensions and angles. When they scanned the cars they found that in typical hand-built fashion, the cars were not only different from one another but they were even different from one side of the car to the other. Quality control at Brown’s Lane in those days could probably be described as laissez faire at best. 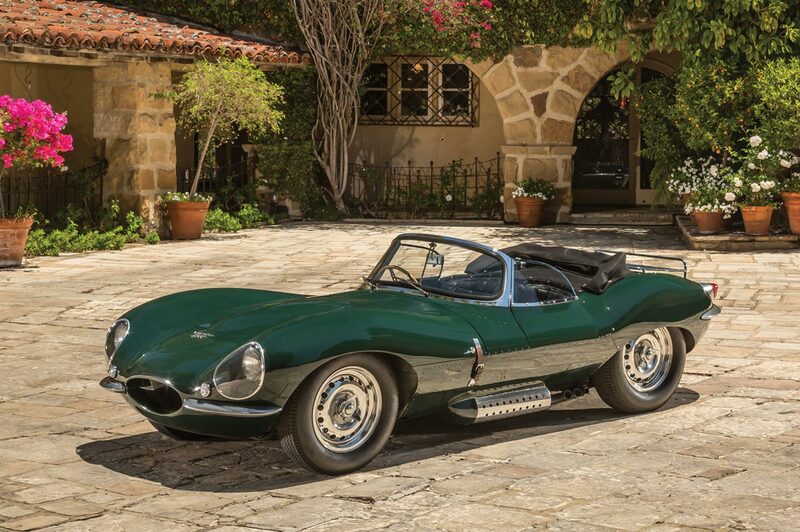 Now though, with modern techniques, Jaguar can be assured that their new XKSS models will be built with an attention to detail and quality and, let’s face it, symmetry that was impossible in the 1950s. Much like the Lightweight E-Types, these continuation XKSS models will use the VIN numbers allotted by the factory in the 1950s and will be 100% authentic. Don’t expect any restomods here. Jaguar nailed the process of making a new old car with their Lightweight E-Types and is very careful to not improve things too much with modern technology. The body will still be hand-beaten aluminum, the engine will be hand assembled and the three glorious side-draft Weber carburetors will be hand-tuned. How much should one expect to pay for such quality? Well, it’s going to be a lot more than McQueen paid for his — try around 1.6 million dollars. Is it worth it? 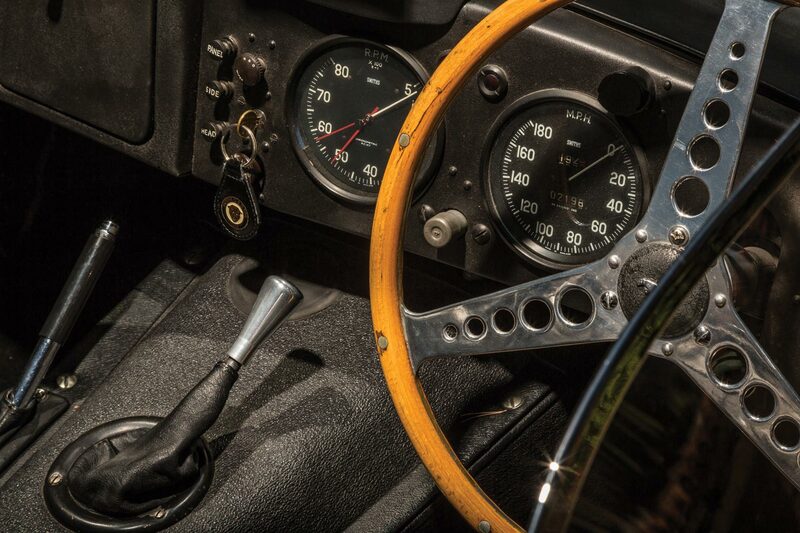 Well, having seen the continuation E-Types in person, we’d say yes. Why would a company like Jaguar go through all this trouble and expense to resurrect a car like the XKSS? Well, the answer lies with companies like Ferrari and their Classiche program, or Porsche Classic, or the Mercedes Benz Classic Center. Jaguar hopes to use the resurrection of the Lightweight E-Type and XKSS to inspire owners of classic Jags to send them back to the factory for restoration because if they can build a new XKSS from scratch, then your XK120 should prove no problem. It also showcases Jaguar’s commitment to its past. British car companies have always traded on their heritage but few have stepped up to actually support their heritage vehicles in the way that Jaguar is doing now. Hopefully it is the start of a trend that will see companies like Aston Martin and Bentley undertaking these kinds of projects because I can only imagine that a world with more DBR1s and R-Type Continentals in it would be a good thing. The XKSS is a gorgeous, dangerous, rare and expensive animal that was born from horror and tragedy. It represents now, as it did in the 1950s, a high water mark for the British automotive industry and for the automotive industry in general. It was a car that was driven by racers and playboys and loved by both. It was the magnum opus of British men in sheds doing what they do best, outthinking those with greater resources and finding new ways to compete in an ever more challenging market. This is a tradition that in some respects, continues to this day. Jaguar isn’t a huge company, they don’t sell that many cars compared to their German rivals but they always shoot for the moon and punch way above their weight class. The XKSS is the reason why we have the achingly gorgeous and equally ludicrous F-Type R and the XK RS. These nine continuations models are Jaguar’s way of fulfilling a promise made sixty years ago to the motoring public and they are another way for Jaguar to honor their past without making it overly precious. We hope that we’ll see these cars and the Lightweight E-Types on the Mille Miglia along with their racing siblings, the C and D-Types, roaring their way down narrow and winding roads with the sound of their straight sixes echoing off of the buildings. Color images courtesy of the Petersen Automotive Museum. V3LLUM is a place for all things creative. From car design to industrial design, every piece of art or product that has ever been created was drawn on a napkin or a piece of paper. We are here to find out what makes designers tick, what inspires them and how they've created whatever they consider to be their finest work. Want to see your design passion featured on V3LLUM? Send us a message.